Controls Flakes: Relieves the symptoms of dandruff with Salicylic Acid to break down flaky buildup. Removes Build up: Mineral-rich clay helps absorb excess oil. Promotes Scalp Health: This unique blend of essential minerals helps promote hair and scalp health. Inactive Ingredients: Water‚ Sodium C14-16 Olefin Sulfonate‚ Coco-Betaine‚ Sodium Laurylglucosides Hydroxypropylsulfonate‚ Aloe Barbadensis Leaf Juice‚ Carbomer‚ Vegetable Glycerin‚ Panthenol (Vitamin B5)‚ Malachite Extract‚ Smithsonite Extract‚ Rhodochrosite Extract‚ Hematite Extract‚ Amodimethicone‚ Undecylenic Acid‚ Mica‚ Titanium Dioxide‚ Melaleuca Alternifolia (Tea Tree) Leaf Oil‚ Citric Acid‚ Montmorillonite (Clay)‚ Sodium Benzoate‚ Origanum Vulgare (Oregano) Leaf Extract‚ Potassium Sorbate‚ Ethylhexylglycerin‚ Natural Fragrance. Free of: Gluten‚ sulfates‚ and parabens. Vegan / Vegetarian / Cruelty-Free / Made in USA. Gently massage into damp hair and scalp. Leave on for 2-3 minutes. Rinse thoroughly. For best results‚ use at least twice a week or as directed by a doctor. Avoid contact with the eyes. If contact occurs‚ rinse eyes thoroughly with water. If condition worsens or does not improve after regular use of this product as directed‚ consult a doctor. Store between 40° to 100° F (4° to 38° C). Protect from sunlight and freezing. Anti-Dandruff Shampoo by Mineral Fusion works great, cleans hair well, and the scent isn't overwhelming. If you have a dry itchy scalp, try this! 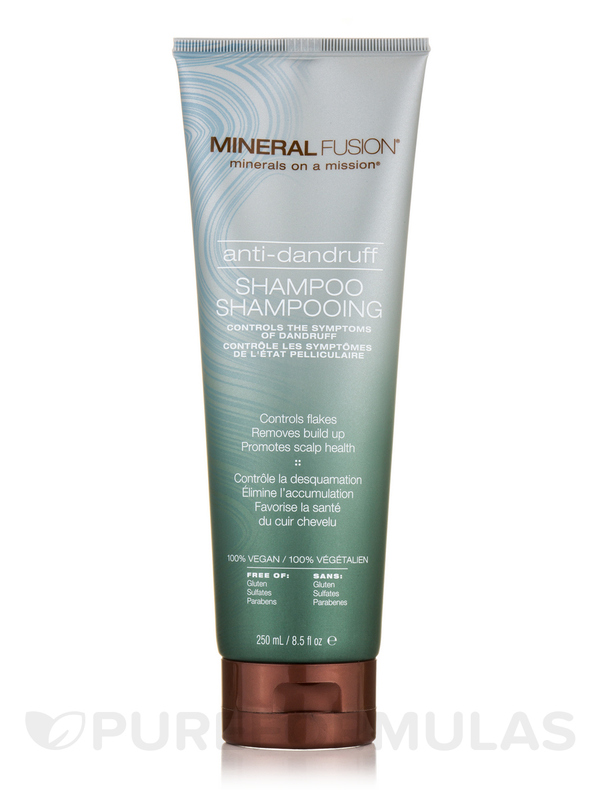 I bought Anti-Dandruff Shampoo by Mineral Fusion because my scalp and hair were extremely dry. The hair follicles were swollen and itchy. I was feeling very uncomfortable. I tried this product and I swear it worked! I like this shampoo because it has far less toxins than the conventional dandruff shampoos, plus IT WORKS! Highly recommended! And in one use, you WILL feel a difference! Effective treatment for irritated scalp and dry hair. Contains far less toxins than the conventional dandruff shampoos Results can be seen and felt with just one use.